The old lighthouse at Widow’s Point in Harper’s Cove was typical of a place labeled “haunted.” Its legend began that day in 1833 when three workers died during its construction and has continued past its closing in 1988 after the death of an actress during the filming of a movie. Since then, the lighthouse has been off-limits. Now that’s about the change. Thomas Livingston, an author of books on the supernatural, has decided to make the lighthouse the subject of his next story. Whatever Thomas expects, it definitely isn’t what he finds. The moment he crosses the threshold, the video on his camera dies, only the audio remains to document what happens. At first, it’s the usual eeriness of being in an abandoned place, going up and down the 268 steps, and settling in. Little by little, the solitude of the place takes over. Thomas thinks he hears voices, decides it’s the ocean and the wind. He sees movement at the edge of his vision. Surely that’s simply imagination. At first, he treats everything as a lark. He’s his usually charming self, the man interviewed on radio and TV. He recounts the legends and various deaths in a blackly humorous tone. Then he finds the diary. After that, the uneasiness escalates, He loses his flashlight. The stairs seem endless. Disorientation sets in. His food has somehow spoiled overnight, the water is filled with salt, and there’s now nothing to eat or drink. The things he reads in the diary seem to act before him. Thomas is trapped inside the lighthouse with no way to escape and no way to call for help, and Monday is a long way off. This is a story the reader will select with a wriggle of delight and a frisson of dread, and after reading, will undoubtedly be left with a pathological avoidance of lighthouses. It’s short, scary, and to the point. It’s the best of the best of ghost stories, the kind to be told around a campfire, or late at night on Halloween while gathered in a group around a flickering fireplace. Reminiscent of Edgar Allan Poe’s more famous tales, in which the entire story is narrated by someone whose point of view comes to be questioned—is it true observation or encroaching madness?—Wndow’s Point will bring a delicious shiver of expectation to the reader, perhaps several. Told in a reality television mode, with Thomas’ video-less first-person narrative being the only clues to what’s happening, if this were a movie, its single-actor performance could become a tour-de-force. As it is, the story leaves it up to the reader to decide if Thomas’ experience is real or if it’s merely the delusions of a “troubled man suffering from pressures for which he refused to seek help.” Merely by picking up this novel, the reader will already have announced which s/he believes. 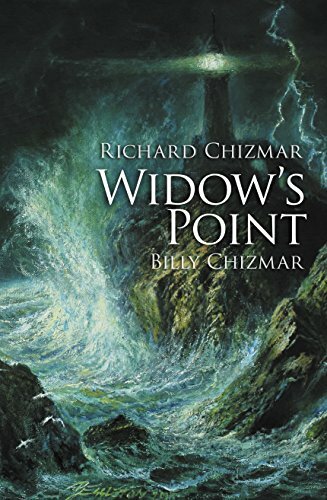 With illustrations by Glenn Chadbourne to further the otherworldly mood, Widow’s Point is definitely a novel to read when there’s someone else in the house, and sounds of life offer an anchor to reality.